The initial 1958 model year of the Edsel brand debuted with much fanfare about the “Teletouch” gear selector. Because the pushbuttons were mounted in a fixed center pod that did not rotate with the wheel, controls proved mostly reliable. We see automotive gear shift levers as one of the most tactile things that can improve the experience of driving an automobile, given a well-executed design. Because there haven’t been more than a handful of gear shift designs that met with mainstream acceptance since the the late 1800s, we decided to look at some of the ones that didn’t catch on – the alternative style gear shifters. When you consider the list of what we consider normal, it really is a short one. Steering column-mounted manual and automatic shifters were the norm yesterday, floor-mounted manual and automatic gear shift levers are the norm today, and paddle shift levers are becoming the norm of tomorrow. You can hop right into any car through the late 1920s, and the manual shift lever is right there protruding two feet high from the floor. Likewise, you’ll find the automatic trans gear shift lever on any full-size American car from the 1970s or 80s right where you’d expect it to be – on the steering column. Odds are if you were born before 1960, you’ve also experienced plenty of manual gear shift levers mounted on steering columns as well. While “three-on-the-tree” column shifters have been out of fashion long enough to be a curiosity now, they are not rare or unique enough to inspire much interest when seen on the types of classic cars that were typically fitted with them new. French-made Delahaye models used gear shift selectors mounted on steering wheel stalks. Instead of moving actual linkages connected to the transmission, the shift lever activated electrical switches which controlled magnetic servos that moved the gears in the transmission whenever the clutch pedal was depressed. This is known as gear “pre selection”. Some gear shift pre selector levers were mounted on steering column stalks, as seen on Delahaye and Cord models from the mid 1930s. 1936-1938 Cord models were equipped with front-wheel-drive and a transmission placed in front of the engine – a location which was impossible to reach with manual linkages. Similar to the Delahaye layout, moving the gear selector lever into each gear simply triggers electrical switches which, in turn, control a vacuum system. Pressure traveling through vacuum lines actually positions the gears inside the transmission when the clutch pedal is depressed. The earliest mainstream American car “alternative” gear selectors were from divisions of Chrysler Corporation, mounted on the dashboard of full-size 1955 DeSotos, Chryslers, and Imperials. It simply took a steering column shift type lever, shortened it, then positioned on the center of the dashboard instead. While this made a great deal of sense, the dashboard lever only lasted one year before push button controls for automatic transmissions became the rage. For 1956, Chrysler advanced from dash-mounted gear shift selectors to pushbutton controls. Unlike Packard’s pushbutton controls introduced this same year, these worked by using direct mechanical linkages instead of electric actuators. Chrysler New Yorker, Imperial, and other Mopar divisions used these push-button transmission controls on their pricier models. Unlike most gear selectors of this time, top-of-the-line Chrysler Imperial pushbutton controls allowed the driver to select 2nd gear or 1st gear individually. Most only had positions for Drive (D) or 2nd (Low). Packard introduced their “Touch Button Ultramatic” transmission control pad on 1956 models. It was standard on the 1956 Caribbean and a $52 option on the Clipper and lesser-priced models. The mechanism was built by Auto-Lite, a major Packard supplier. Unlike Chrysler Corporation push button controls, Packard’s was electrically actuated and used an electric shift motor (essentially a modified starter motor) to physically move the gears. At times, it would prove to weak to move the car out of Park on a steep hill and cause a circuit breaker to blow. The system was problematic, but because 1956 was Packard’s last year before bankruptcy, the system was never perfected. Ford Motor Company responded to Chrysler’s lead and introduced their own push button transmission gear selector on 1957 Lincolns and high-end Mercury models such as the Monterey. Like Chrysler’s, buttons pushed mechanical linkages that moved an actual rod that selected gears, and there was no complex electric engagement like Packard’s. Mercury marketed the push button system as “Merc-O-Matic”. Edsel’s marketing department promoted the Teletouch as a logical progression in the process of making the steering wheel a central command center – pointing out superior dashboard visibility was now possible without the column-mounted gear selector in the way. Dealers were given Teletouch face-masks to wear and pass out as promotional items. While a standard gear selector was available as a reduced-cost option for the automatic transmission on Edsel Ranger, Pacer and station wagon models, Corsair and Citation models came standard with Teletouch. The electric servo motor that actually changed gears in the transmission was prone to failure and erratic performance due to its hot, wet and dirty operating environment between transmission housing and exhaust system. Teletouch was a 1-year only item, and was not offered on 1959 Edsels or other Fords of any kind. Lincoln and Mercury models stuck with the less complicated mechanical linkage system, and the push button controls received a stylish update for 1958. A wider view of a 1938 Delahaye steering column mounted gearshift “pre-selector” lever. 1936-1938 Cord models were equipped with front-wheel-drive and a transmission placed in front of the engine – a location which was impossible to reach with manual linkages. Instead, moving the shift lever into each gear simply triggers electrical switches which, in turn, control a vacuum system that actually positions gears within the transmission when the clutch pedal is depressed. A wider view of a 1937 Cord 810 4-speed manual shift “pre-selector” lever. The earliest American car “alternative” gear selectors were from divisions of Chrysler Corporation, mounted on the dashboard as shown on this 1955 DeSoto Fireflite. Seen here is a slightly revised version of the dash mounted automatic transmission shift lever, as equipped on 1955 Chrysler 300 models. A wider view of dash-mounted gear selector levers found on the 1955 Chrysler 300. Packard introduced their “Touch Button Ultramatic” transmission control pad on 1956 models. It was standard on the 1956 Caribbean and a $52 option on the Clipper and lesser-priced models. The mechanism was built by Auto-Lite, a major Packard supplier. Unlike Chrysler Corporation pushbutton controls, Packard’s was electrically actuated and used an electric shift motor (essentially a modified starter motor) to physically move the gears. At times, it would prove to weak to move the car out of Park on a steep hill and cause a circuit breaker to blow. The system was problematic, but because 1956 was Packard’s last year before bankruptcy, the system was never perfected. For 1956, Chrysler advanced from dash-mounted gear shift selectors to pushbutton controls. Unlike Packard’s pushbutton controls introduced this same year, these worked by using direct mechanical linkages instead of electric actuators. Chrysler New Yorker, Imperial, and other Mopar divisions used these push-button transmission controls on their pricier models. 1956 Chrysler Corporation pushbutton gear selector design, as seen on 1956 Plymouth models. These were used for vehicles equipped with both 2- and 3-speed automatic transmissions. 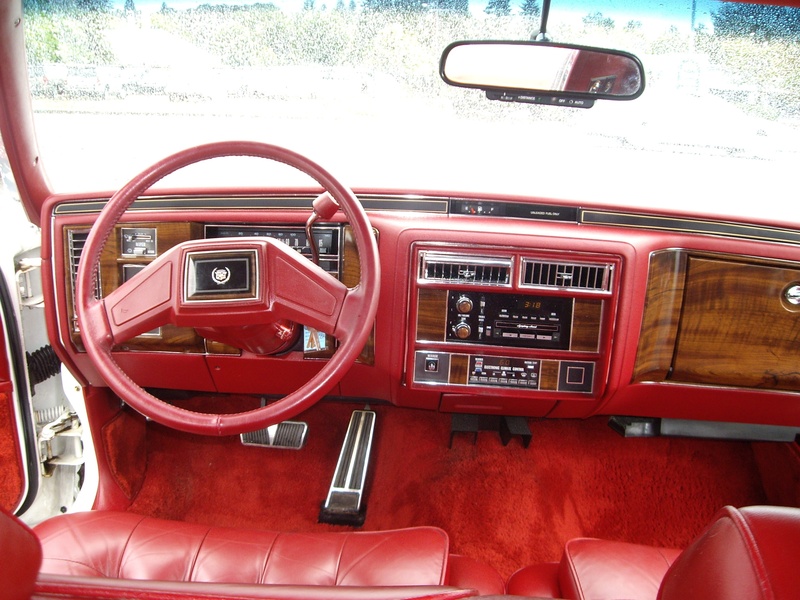 Unlike most gear selectors of this time, top-of-the-line Chrysler Imperial pushbutton controls allowed the driver to select 2nd gear or 1st gear individually. Most only had positions for Drive (D) or 2nd (Low). Ford Motor Company responded to Chrysler’s lead and introduced their own pushbutton transmission gear selector on 1957 Lincolns and high-end Mercury models such as the Monterey. Like Chrysler’s, buttons pushed mechanical linkages that moved an actual rod that selected gears, and there was no complex electric engagement like Packard’s. Ford Motor Company experimented with electro-mechnaical steering wheel “Teletouch” mounted gear selector buttons, and introduced them on 1958 Edsels. The Edsel Teletouch center pod was fixed and proved reliable because it did not rotate with the wheel and put stress on wiring components. While a standard gear selector was available as a reduced-cost option for the automatic transmission on Edsel Ranger, Pacer and station wagon models, Corsair and Citation models came standard with Teletouch. The pushbutton gear selector on 1958 Plymouth Fury models was located to the left of the steering wheels. A closer view of a transmission selector for a 1958 Plymouth Fury. Mopar division push button shift controls, as seen on a 1959 Dodge Coronet. Chrysler Corporation pushbutton transmission controls, as seen on higher line 1959 company models such as this Plymouth Fury. By 1963, this particular design of pushbutton transmission controls had worked its way down to lower models such as the Dodge Dart and Plymouth Valiant. Pushbutton controls from a 1958 Mercury. A wider view of a 1958 Mercury Monterey equipped with that year’s design of pushbutton transmission controls. Here, a 1960 DeSoto Firefly is shown. A close inspection reveals a blanked out button, because this vehicle was equipped with a lower-priced 2-speed automatic instead of the 3-speed automatics most left the factory with. The 2-speed automatic was dropped after 1960. This 1960 DeSoto Firefly is equipped with Chrysler’s 3-speed automatic, unlike the one shown in the previous picture. Chrysler used this pushbutton design on their 1961 300 model. A closer look at the pushbutton automatic gear shift lever controls found on 1961 Chrysler 300 models. A 1961 Chrysler Corporation pushbutton transmission control panel, as seen on a ’61 Plymouth Belvedere. A wider view of a 1961 Plymouth Belevedere interior. Pushbutton controls, as seen on a 1962 Dodge Polara. This style was used through 1963 as well. Chrysler’s top-of-the-line Imperial models continued to use vertically stacked pushbutton transmission controls. Here, a 1963 Imperial is shown. Pushbutton controls as seen on a 1964 Dodge 880 model. 1964 Chrysler Imperial pushbutton gear selector. This was one of the final pushbutton designs Chrysler used before reverting back to traditional gear shift levers during the middle of the 1965 model year. Column shifter from a 1977-85 Mercedes 240D/300D/280E (123 body). When Dodge introduced the 2006 Charger, automatic gear shift levers were on the center console. The exception was police package models, which featured this column shift lever. For the 2013 model year, all Dodge Ram pickup trucks feature this gear selector knob mounted on the dashboard. Up-down steering wheel mounted paddle shifters are common on today’s performance cars. Here, a 2013 Ferrari California is shown. This entry was posted in Vehicle feature articles and tagged 1950s, 1955, 1956, 1957, 1958, 1959, 1960, 1960s, 1961, 1962, 1963, 1964, chrysler, column shifter, control, controls, DeSoto, Dodge, Dodge Charger, Edsel, Ford, gear shift lever, Imperial, plymouth, push button, pushbutton, Ram, trans, transmission. Bookmark the permalink. In General, it’s a Great Article! There are a few discrepancies. How can a Column shifter in Mercedes from a 1977-85 be considered “alternative”? Mercury did, but Lincoln did not have push-buttons in ’57-’58. Lincoln didn’t get them until 2013, and then only on certain models. Right now MKC, MKX, MKZ, and Continental do have them. The “Pre-Selector’s” of the 1930’s Delahaye and Cord are fascinating, and seemed quite sophisticated for the time.